They're Bringing the Torrance House "Home"
by Angie Torrance, Special For "The Quill"
Gladstone- The flood of 2008 forced many families out of their homes, many for good. Now, months later families are picking up the pieces, buying, building, renting or waiting to acquire new homes. Some plan to return to the site of their loss, taking their chances for the land they love. Others have moved on. For Helen Torrance staying was not an option. She has moved too many times. Leaving her house of 37 years was not something that she was willing to do either. So, she decided the only thing left to do is to pack up and take her house with her. 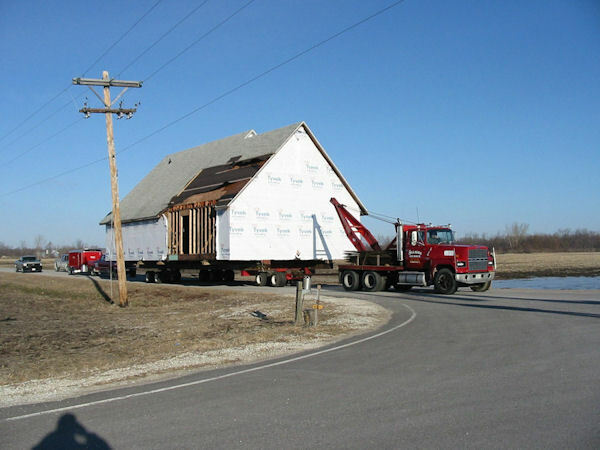 So, on last Wednesday morning, March 11th, the crews arrived to begin the journey of moving the Torrance family home. It had already been prepared and was loaded on the trailer. The new location was only three miles up what is called "the Twomey road" on a hill that is a much safer location. As yet, water has never flooded the area where the Twomey elevator and grain buildings are located outside the Gladstone Village limits. Only three miles, but it was a slow process as the house rolled along at 7 miles an hour. And there was the waiting, occasionally, for the power company to assist with moving the lines so the large home on wheels could pass through. Helen and her children, grandchildren, family and friends either followed or watched from the top of the hill. This was the same hill where these same folks perched on June 17, 2008 to watch the flood waters roll in. There were mixed emotions heavy with memories of that awful day that forced so many out of their homes. Helen and her late husband Frank Torrance built their house in 1971 for their family. In the spring of 1972. they moved in with their five children; Ervin, Mike, Jane, Russell and Mark. Since then, this home has been the gathering place for family and friends. It is full of many happy memories as they used the house for countless celebrations. There have been wedding receptions, graduation celebrations, birthdays, anniversaries, the list goes on and on. The threshold has been crossed with many grandchildren and great-grandchildren, and there were the sad occasions when they had to say good-bye to family members and they would gather there to mourn a loved one. Frank passed away in 2006. It was then that the family home served as a comfort and a shelter, to aide Helen and her family to heal. It was no surprise that Helen, along with her children, decided to move this house, full of memories to higher ground. Now, in its new safer place and across from her son's family home west of Gladstone, her children, grandchildren, family and friends will once again, go through Helen's door to carry on with the traditions and memories that have been with them for years. Although, it has been an emotional trip, there is comfort now, for the Torrance family house is "home".